For David Preston, the term “open source learning” -- a variation on inquiry learning or passion-based learning -- is about helping students choose their own learning path, an approach that already has some well-known champions among educators. Preston's current classroom centers around the publication and maintenance of students' personal blogs. The blogs themselves are a requirement, but the content and medium used in many student responses—be it text, video, audio, or some combination—are often the result of students' own creative vision. Preston also pushes students to think critically about the implications of their digital actions through virtual discussions with collaborators, such as digital renaissance man Howard Rheingold, Canadian blogger, journalist, activist and author Cory Doctorow, and the National Institute for Technology in Liberal Education's Bryan Alexander, among others. But when Preston began teaching at Los Angeles' James Monroe High School in the pre-social-media world of 2005, he accomplished many of the same goals by assigning pen-and-paper, open-ended journal entries and holding class-wide debates driven by research from honest-to-goodness, hard-bound books. He also says there's still room in open source teaching for academic standards, and that the common standards movement is important in terms of creating benchmarks for students nationwide. BLOGGING: Blogs are the centerpiece of student work in Preston's classroom. Students not only publish most of their work here, but also use blogs to share feedback, collaborate for group assignments, and even hold chat discussions with authors or other subject experts. VIDEO-CONFERENCING: Students use video both to visit with authors whose work they've read, and occasionally to offer insight to outsiders during conferences or interviews. 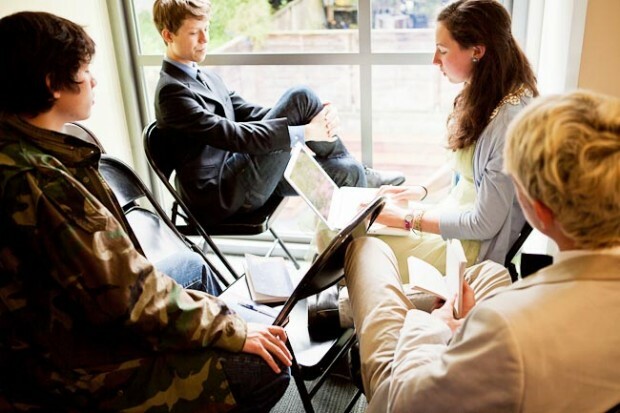 COLLABORATIVE WORKING GROUPS: Like-minded students convene around an interest or idea of their choosing, such as creative writing, fitness, graphic design, etc. Using their classes' blog community, they try to share the idea or interest with others for the purpose of boosting performance on the AP Literature and Composition exam. SMART GOALS: In another twist on an old theme, students state their personal goals for the rest of the term. Those goals, and mapping and executing a path toward them, evolve into a senior project. In order to unite other teachers who have already found a similar path, Preston is now considering helping to launch a national organization devoted to open-source learning. Discussions with colleagues about the launch of an open-source learning foundation appear to be at a preliminary phase. But when it does launch, the organization would forward an approach that, at its core, is about students choosing their own learning path. The association's purpose, he says, would be “inviting people to the policymaking table that don't normally have a direct voice. And I'm not just talking about learners and tech-savvy teachers and administrators. I am also talking about neurologists, leaders in the Internet culture,” and people across other contemporary professions. Those voices would echo the equally variable open source learning approach, which is not necessarily dependent on technology, despite the connotation of “open source” in the software and information industry.